Remember Wolfbones? Kayla Loren's (of Heroes and Underdogs) awesome new side-project who released that amazing cover of Paramore's "Still Into You" last year? 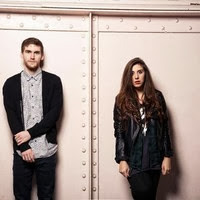 Well, today we couldn't be more excited to premiere "Cannonball" - the duo's debut single! And on top of that, you can download the track FOR FREE! Expect to hear more new tunes from the New Yorkers later this year.